Orange Little League was founded in 1958 by a group of enthusiastic dads who simply wanted their sons to play baseball- our National Pastime. The first playing fields were constructed at West Orange Elementary School and the organization was hence dubbed "West Orange Little League". The founding Board of Directors consisted of Ernie Elgas, Gene Colgan, George Clark, Don Dart, Elmer Eggers and Gene Smith. The construction of the first playing fields is reminiscent of the efforts to build today’s Orange Little League fields. It was a huge community effort. Over at West Orange school, the founders built the first backstop with commercial fish netting donated by an Old Towne merchant and poles given by the Southern California Edison Company. The baseballs tended to roll right through the fishnet, so founders acquired mattresses from empty barracks at the El Toro Marine base and put them at the base of the backstop to stop balls. Catchers loved it! Eventually, they rigged up rolling backstops that came and went for games. The league grew rapidly in the first three to four years with lots of grassroots energy and support. When the league outgrew West Orange School, the city and local schools joined in and helped move the league to its present location, Sycamore Elementary School and Portola Middle School. The first backstop was installed on the corner of Elm Street and Sycamore Street by the "20-30 Club", a local service group enlisted by Gene Smith to help. This was a group of young men in their twenties and thirties who worked together to provide lots of wonderful things in Orange, especially projects serving the youth. Fundraising was needed, of course, and came from good old pancake breakfasts, the ever-popular Snack Bar (a small trailer on the south side of the playground) and the sale of baseball caps. Founding Board Member Don Dart was a United States Marine who had the caps made in Japan for 35 cents each and flew them back to Orange, where he sold them for $5.00- a nice profit in the 1960s! The caps were seen all over town. Local merchants paid a $175.00 fee to sponsor a team. A few of the early sponsors were Frank’s Sporting Goods, Welch’s Concrete, First National Bank, Higgans Furniture, Bill Corwin Ford and Max Reynold’s Roofing. The Littau family donated sand and dirt from their business and Joe Meyer rolled it out with his business equipment. In the early days, the season sign-up fee was $1.00 and nobody was turned away. Opening Day saw approximately 100 boys wearing uniforms consisting of tee shirts and caps, and you didn’t see many cleats or fancy gloves. Today, the backstops look different- no more fishnet and mattresses! The Snack Bar is no longer a small trailer, and the uniforms are much fancier. 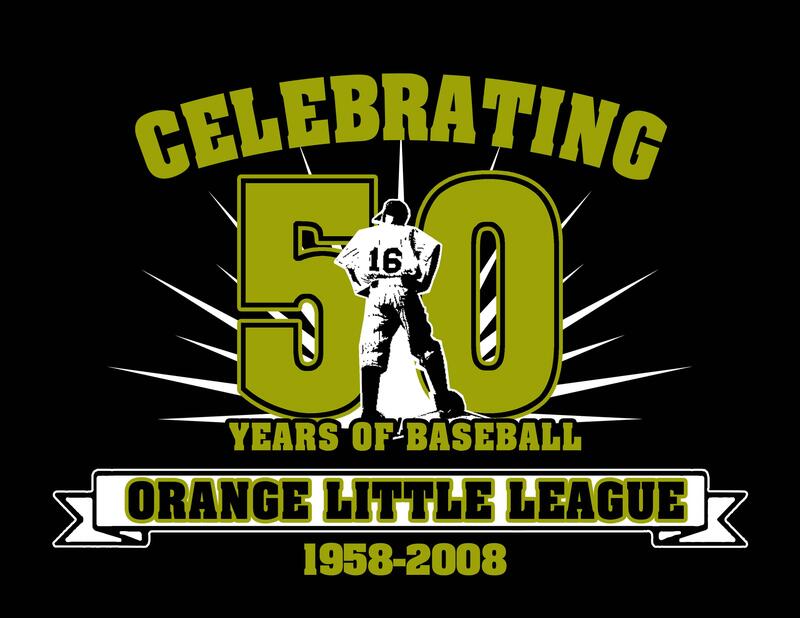 However, one can’t help but notice the hallmarks of Orange Little League, which remain the same 50 years later. Yesterday and today, the league succeeds because of the generosity of the parents and families who willingly give their time, creative talent and resources, coupled with the support of the City of Orange, the Orange Unified School District, and our local merchants. Orange Little League demonstrates an American community that loves its children, families and baseball. We’d like to offer a sincere thank you to the founders of West Orange Little League and to all who have and continue to make Orange Little League flourish today. We look forward to another 50 wonderful years!